Manufacturers and Distributors of wall mount and free standing Outdoor Stainless Steel Showers with exceptional quality and features. Perfect for any outdoor environment. Outdoor Shower Company is the leader in stainless steel showers available in a multitude of designs: Wall Mount, Free Standing, ADA Compliant, Hand Spray, Foot Shower, Multiple Shower Heads. 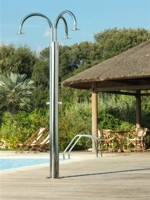 Stainless Steel parts are guaranteed in any environment with a 10 year warranty.